Mysimba is a weight loss drug created in America my Orexigen Therapeutics. The FDA (American regulatory body) sanctioned its use as a prescription medication in 2014, but the regulatory bodies in the UK did not provide it with a medicine licence until 2017. Obesity levels in the UK have become so high Britain is often called the “fat man of Europe” and, when it comes helping the obese, the options available to GPs is somewhat limited; so the prospect of a new prescription weight loss drug would appear to be a good thing. Mysimba is an appetite suppressant. Drugs and supplements that are designed to work in this way control the hunger pangs that can make dieting so hard and cause many people to throw in the towel. There are a number of ways appetite suppression can be achieved, but Mysimba works by stimulating the brain in a way that lessens the desire for food. Naltrexone (90mg): A medication that is primarily utilized to help people beat drug addiction. It can also be used as a treatment for alcohol abuse. 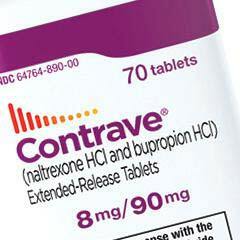 Naltrexone belongs to a class of drugs reffered to as opiate antagonists. It stimulates the brain to prevent opiate effects, such as pain relief and feelings of well-being. Bupropion (78mg): An antidepressant that also has value as a smoking cessation aid because it can quell the urge to smoke and lessen the effects of nicotine withdrawal. Researchers noticed some people who were using Bupropion as an antidepressant were losing weight, so they decided to combine it with Naltrexone because it offers similar benefits and can suppress interest in sweet food. In clinical trials, 50.8% of users attained a weight loss of 5% or more (after 16 weeks). This suggests the drug is only likely to help one out of every two users. Mysimba tablets have to be swallowed whole and washed down with a glass of water. They should never be chewed or allowed to dissolve in the mouth. It is also recommended the tablets be taken with food. The dosage begins with one tablet per day and is gradually increased. Week 3: Two tablets, taken each morning, plus one tablet taken during the evening. Customer reviews suggest Mysimba may work well for some people. Unfortunately they also suggest a lot of people may experience side effects. Mysimba can react badly with certain medications and is also not a suitable option for anyone who suffers from certain medical conditions, including high blood pressure and bipolar disorder. So if your GP is considering prescribing Mysimba you must be sure he is aware of any changes in your health, and any medications you have been provided with via other sources (dentists, hospitals, etc.). The chance of side effects is reasonably high, 23.8% of the participants in clinical trials reported adverse effects and had to discontinue using the drug. 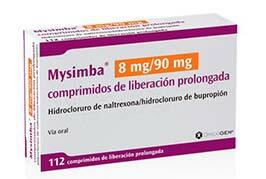 The most commonly reported Mysimba side effects are nausea, headaches, abdominal pain, joint pain, restlessness, and dizziness. The drug can also cause side effects of a more serious nature and is known to be capable of triggering manic episodes and suicidal tendencies. It is not possible to buy Mysimba without a doctor’s prescription, but many people who want to lose weight will not be eligible for one. UK legislations only permit doctors to prescribe weight loss drugs to people who are dangerously overweight (BMI 30+). Even when patients meet this criteria a prescription will only be issued when another health condition exists, such as diabetes, which may be further complicated by obesity. Mysimba is a controversial weight loss drug that only appears to have a modest chance of helping dieters to lose weight. Bearing in mind the relatively high risk of side effects, it would appear to be a very poor option, but the drug is intended to be used under a doctor’s supervision, so the treatment will be closely monitored and treatment is likely to be cancelled if any overly acute reactions become apparent. However, Mysimba is an appetite suppressant. Nothing more. The best over-the-counter supplements can offer dieters a similar level of support (without side effects) and provide additional benefits, such as accelerated fat burning. This allows them to easily outperform a drug like Mysimba.